Higher Trajectory Attained: This is Huge. After an intense focus during the last half of May, our June higher trajectory has been attained. 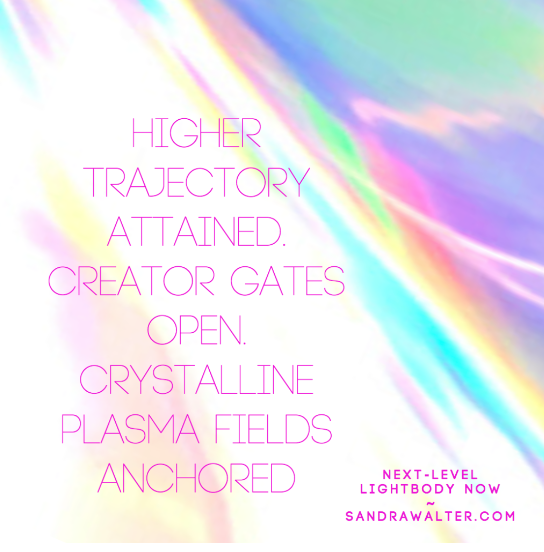 Infinite gratitude for all Gatekeepers, Gridworkers and beloved ones in Service who diligently ushered in these higher frequencies on behalf of all. I AM bathing in these new frequencies at the moment, so this is a brief update. Our key shift points were May 17 evening when the Creator Gates opened, May 19 as the Cosmic Trigger opened the stargate system to flood us with Solar activations, massive fields of Source-encoded crystalline plasma rushed in on May 26, and then the purifying Full Moon which transitioned collective lower timelines. Our intention was to ensure the higher trajectory of June Solstice, and that is accomplished. We are now on track for the June migration of realities, already in progress. Most of you are already experiencing the beautifully intense consciousness-shifting influxes which will be consistent all throughout June. Our beloved SUN is also adjusting; this acceleration into crystalline embodiment happens on a quantum level. As within, so without. Alignment with pure Creator dynamics is key. This is affecting all realities; the opening of the Creator Gates is changing the way in which global HUmanity creates in the Now. The intention of these New Earth Nowevents is multidimensional, I AM sure most of you realize the impact of unifying the Light Tribe to Divine Co-creation in the Now. Yes, it assists in the accelerated timeline shifts. It also aligns more hearts with the higher realities, which speeds up the migration of the collective. We assist everyone in catching up to what is occurring. Shed the illusion of density, it’s already gone. Gratitude for the beautiful feedback about the heart-cleansing and healing effects of this experience. The more awakened ones who can align with their Creator State in the Now, the easier it is for all. Embrace this Service, follow along, pause the video when you need to, write down your creations and grid them, tone out loud, speak out loud … be with us in the no-time zone of Now. If you are attending Part II on June 9, your prerequisite is to go through the experience at least once. Note it is different, more expansive, every time you engage. New Earth Now Part IIwill be presented online June 9. Part IIdives into applying Creator State dynamics and timeline resonation to your service work and personal lifestream. Unity consciousness has so much to offer us, and our collective consciousness becomes more coherent, there is Divine opportunity to accelerate freedom for all willing hearts. SUNdayUnity meditations will be strong this week. We are sending out these new Creator Gate codes to upgrade the collective to the Now. All willing hearts desiring this new level of Light and Peace for all, join us. Details and guided meditation available HERE. Infinite blessings to all of Creation!